Jonathan Kozol has been a leading educational critic and social activist since 1967 when Death at an Early Age, his book about racism in Boston's schools, was published and won a National Book Award. Since then, Kozol has written eleven more books which focus on such issues as segregation in schools and society, poverty, inequitable school funding, effective teaching and curriculum choices that help create good citizens and good learners, teacher leadership in matters related to social justice, literacy, and homelessness. 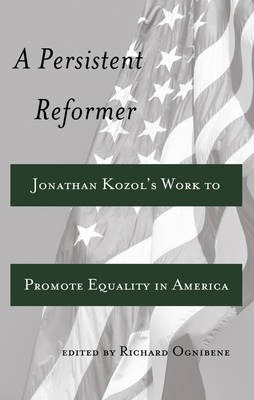 This book organizes Kozol's texts by topic, analyzes his perspective and proposed solutions for the issue under review, and examines the contemporary status of those issues to determine the continuing relevance of Kozol's ideas today. A Persistent Reformer is a critical read for pre-service and in-service teachers, graduate students, administrators, and anyone concerned about educational reform today. Contents: Nicholas Michelli: Foreword - Richard Ognibene: Preface - Richard Ognibene: Introduction - Erica Frankenberg/Tiffanie Lewis: School Segregation Then and Now - Sue Books: Amazing Grace and Ordinary Resurrections: A Prophetic Cry of Rage and Anguish - Jane Fowler Morse: Still Savage, Still Unequal - Timothy Glander: Stirring Up Noble Discontent: Jonathan Kozol Talks to Teachers - Richard Ognibene: Jonathan Kozol on Teaching - Jennifer Danridge Turner/Kelsey Pope: On Lanterns and Footwalkers: Jonathan Kozol's Vision for Literacy for Our Times - Fred Boehrer: Lessons for Today's Homeless Families and Immigrants: Reading Jonathan Kozol's Rachel and Her Children. Richard Ognibene is Professor of Education Emeritus at Siena College. He was previously affiliated with Seton Hall University and served as Dean of the College of Education and Human Services. His recently published articles have focused on school choice and charter schools, social justice and education, and a critique of E.D. Hirsch.